The Lenox Hill Neighborhood House annual benefit is one of my favorite spring events. With 50 tables decorated by noted interior designers, it is a festive evening of stylish entertaining for a wonderful cause. Over the last severals years there have been many memorable tables, a few seen in the collage below. 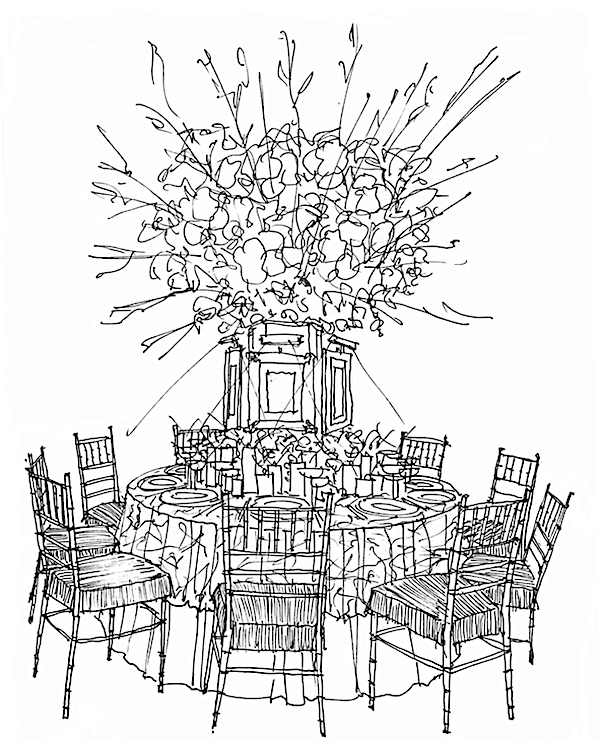 While I will be sharing the finished tables after Wednesday’s event at Cipriani, I am delighted to offer you a sneak peek at the concepts for a few of this year’s tables. 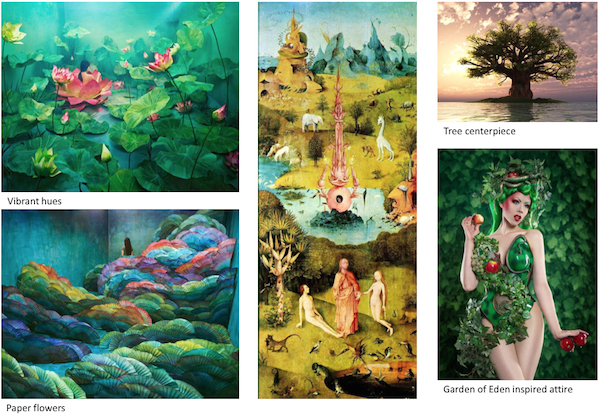 The Garden of Eden theme offered lots of leeway for interpretation! 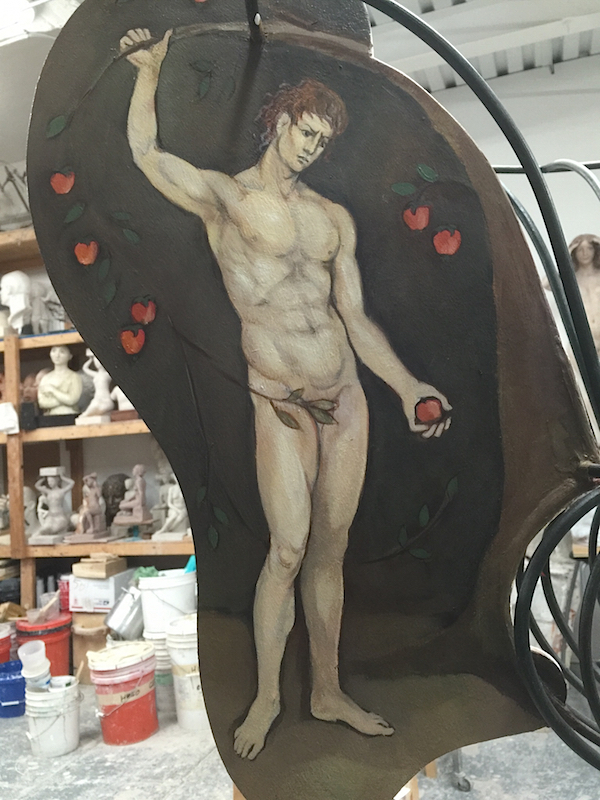 David Duncan‘s classically themed “Paradise Lost” table is inspired by Milton’s monumental 17th century poem portraying the loss of innocence and “Man’s first Disobedience.” Illustrated by William Blake, the poem depicts how the Garden of Eden’s temptations proved impossible to resist, resulting in Adam and Eve’s fall from grace. David is one of the design chairs for the event. I was not at all surprised to learn Nick Olsen entitled his table “The Dark Side of Eden.” The designer partnered with De Gournay for a very elegant version of his dark vision. 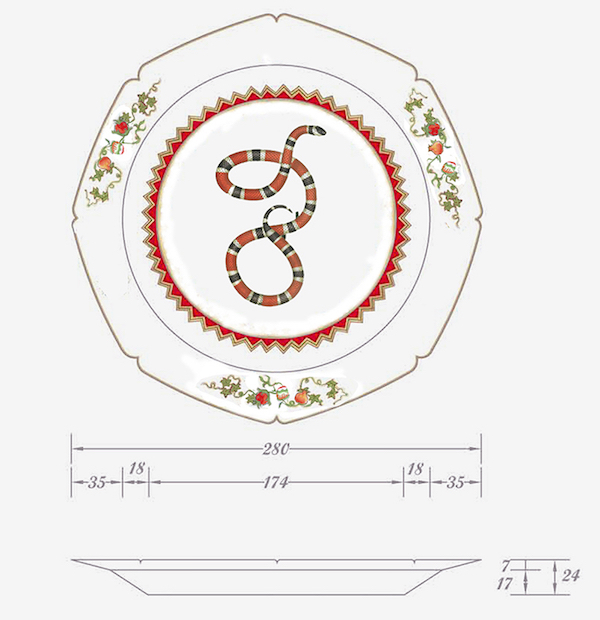 Showcasing the brand’s custom capabilities, they have produced bespoke hand painted porcelain specifically for the event, each plate featuring a different coral snake, as above. The tablecloth features de Gournay’s lush Palms design and chair cushions and enormous tree of life centerpiece, below, will feature hand painted designs on de Gournay duchess satin. My kind of dark side! 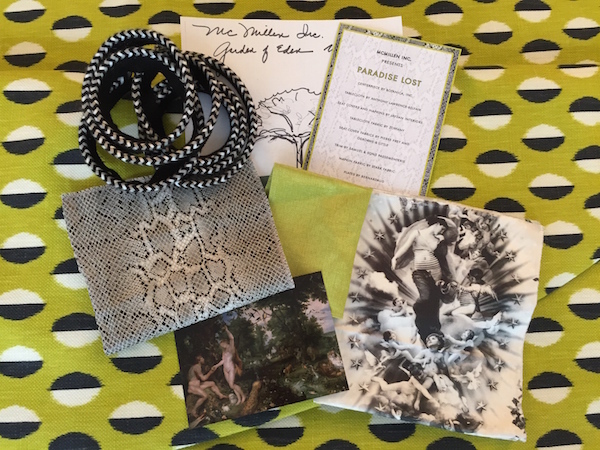 Marco Scarani of Creel & Gow explains that their “Eden Evening Fig Fest” “was inspired by the idea of the garden of Eden, filled with fig trees and exotic birds.” Opened in 2012 by Jamie Creel and Christopher Gow, Creel & Gow is an exquisite cabinet of curiosities. 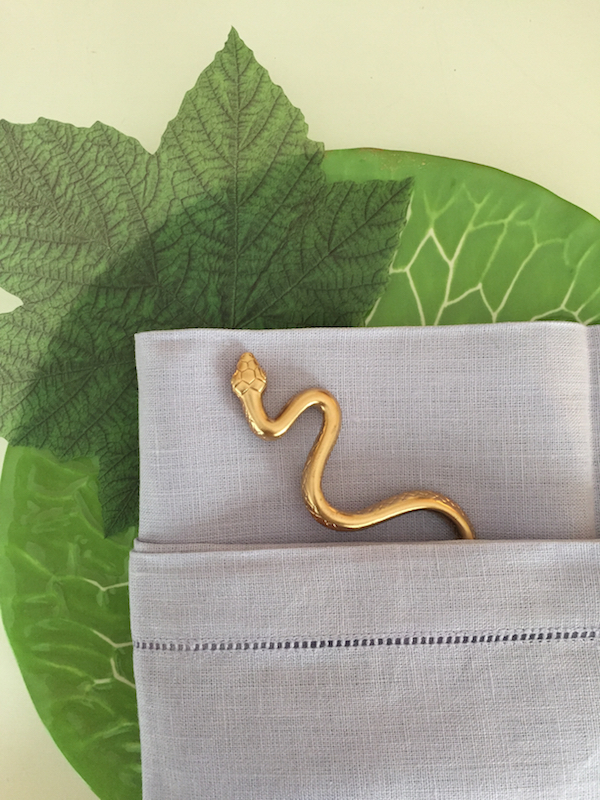 Favored by discerning collectors and devoted designers, their unique and constantly updated decorative objects and exotic accessories are sourced from around the world. 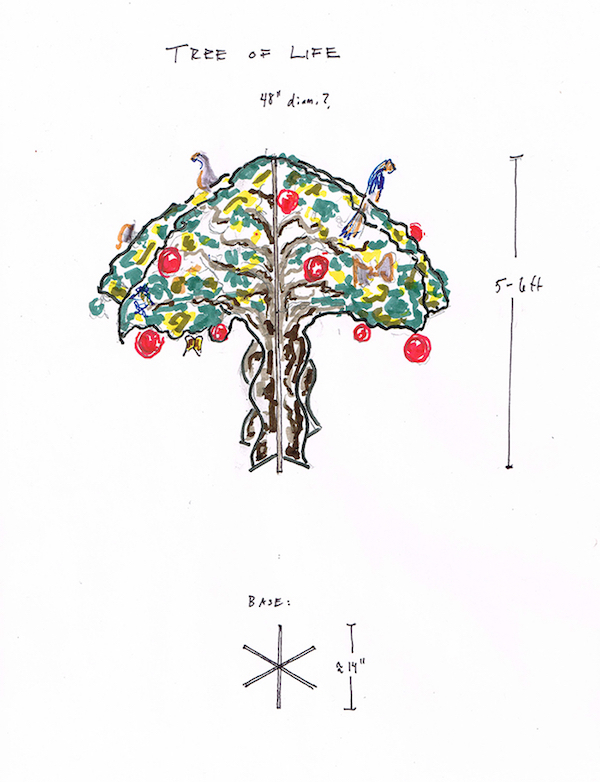 “The fig is a symbol of fertility in Mesopotamia, the cradle of civilization versus the more traditional symbols of the apple and snake,” Scarani continues. 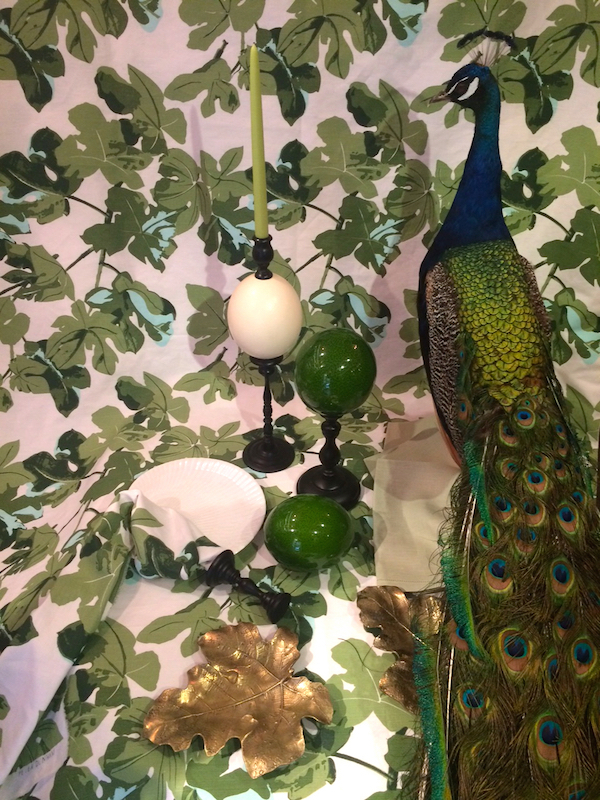 “We wanted to explore these origins and new ideas of creation and creativity.” Their tempting table will feature, appropriately, Peter Dunham’s Fig Leaf fabric with peacock, vintage brass fig trays, ostrich egg candlesticks and objets from Creel & Gow. 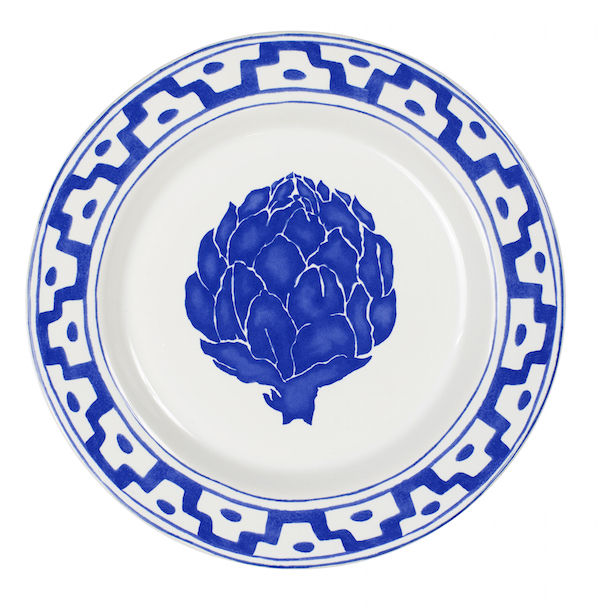 Oscar de la Renta Home will debut their charming new blue and white Artichoke pattern that so many of you liked from NY Now. Designed by Creative Director Carolina Irving, the table will be country chic, inspired by a dinner with Oscar in Connecticut or Punta Cana. Featuring simple red and white striped tablecloth and artichoke plates, Rambert Rigaud will be doing the florals. The former studio director of Yves Saint Laurent and Dior Haute Couture, Rigaud is a widely known Parisian florist with his own flower and home shop, Rambert Rigaud Fleuriste en Herbe at 2 Rue de L’Université in the chic quartier of Saint-Germain. Take a peek to see Carolina preparing her ODLR table last year. Anyone who follows Philip Mitchell on Instagram has seen his beautiful sketches. 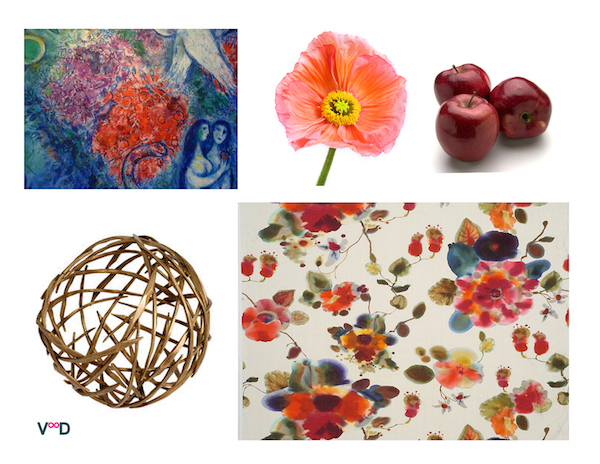 Below we see his Garden of Eden gala table “Temptation.” It will feature the new new Brunschwig & Fils “Tree of Life” fabric with a curated collection of original artwork depicting temptation. 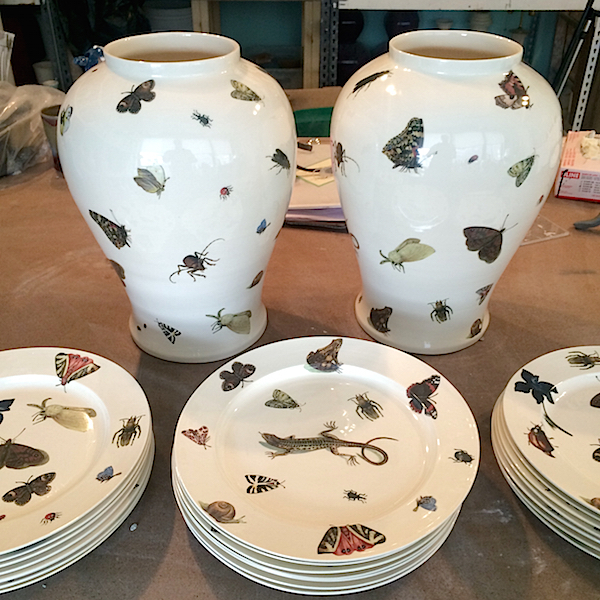 Christopher Spitzmiller was thrilled to share his stunning new butterfly and bug plates and ginger jars he made for his table. “I’m excited to show them off!” He will be pairing them with Indian Zag in Indigo by Suzanne Rheinstein for Lee Jofa. 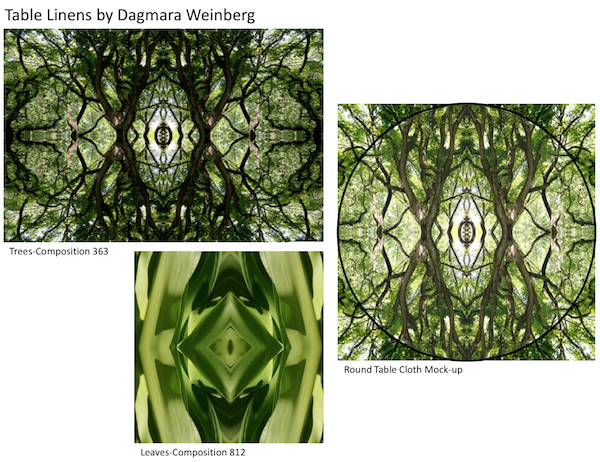 and photographic prints by Dagmara Weinberg, whose work I included from the AD Home Show, and The Artist’s Table on the table linens, below. Table accessories range from luxurious to whimsical additions. Alberto Villalobos and Mercedes Desio of Villalobos Desio, both design chairs, cite the “ethereal world of Chagall, with its vivid colors and soft brushstrokes” as inspiration for their “Lure” table. Using “happy and inviting colors with a graphic and interesting centerpiece,” their version of a Garden of Eden is redolent of the freshness of a spring garden. 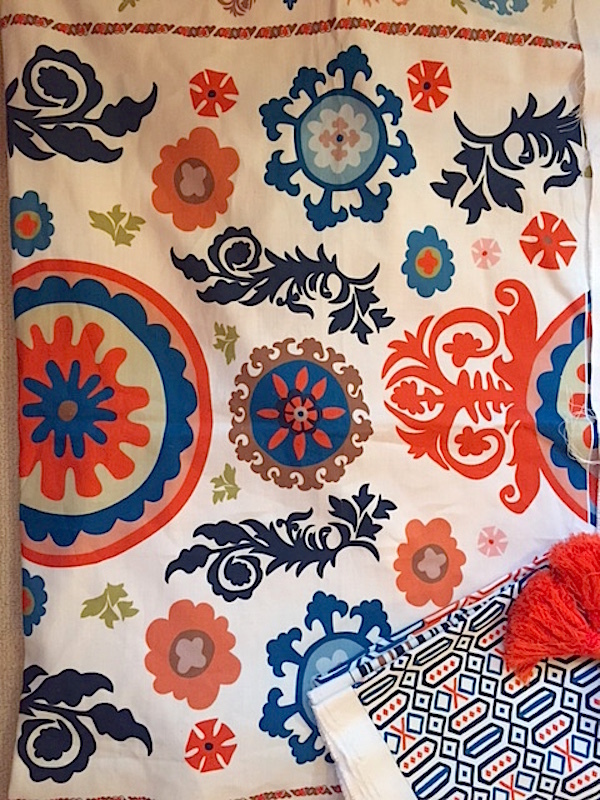 Longtime Lenox Hill participator Lindsey Coral Harper‘s table is entitled “Birds of Paradise” and will feature fabrics for tablecloth, napkins and chair seats from her new collection for Guildery. I can’t wait to share these and other tables at the Lenox Hill Garden of Eden gala on Wednesday! This entry posted in design, interior design. Entry Tags: Entertaining, interior design, Lenox Hill Neighborhood House Gala, Tabletop Bookmark the permalink. Stacey I am in heaven. 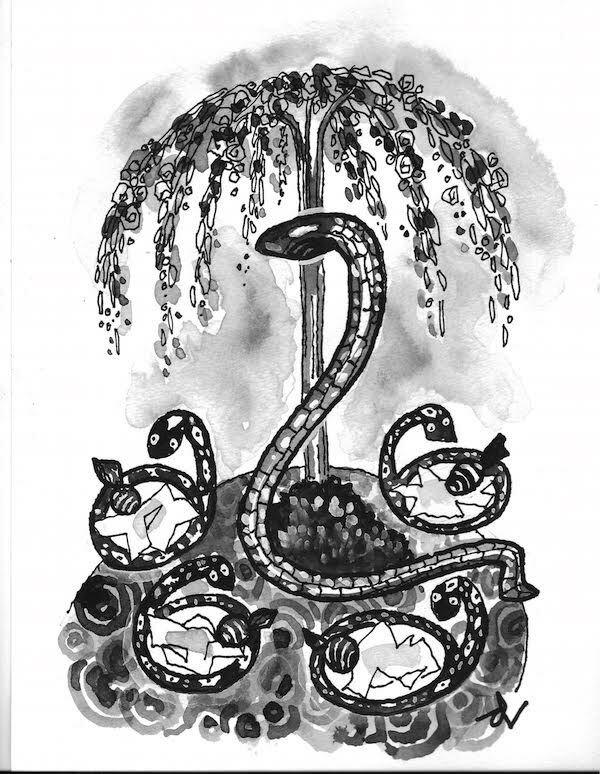 The serpent theme, the art, the new butterfly and bug collection by Spitzmiller( I hope he makes it into lamps as well!) Harper’s table. They are all gorgeous!! Thanks, Stacey, for the preview! 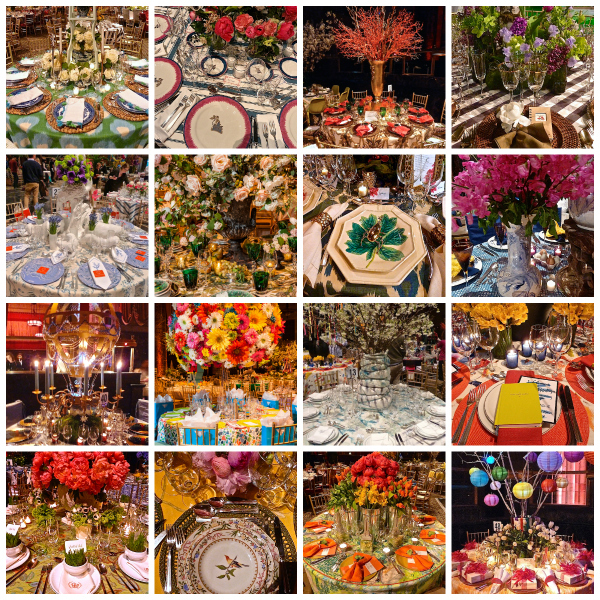 Cannot wait to see these beautiful tablescapes! Such a great spring theme! beautiful post – love seeing all the inspiration. I hope you’ll come by and see our Eve’s Temptation table with our fig-inspired fabric we created especially for the event from our Stacey! Hope all is well. All these designers are so creative and these tables will be nothing short of breathtaking! We can’t wait to see the final settings. Hope you’re enjoying this beautiful day! Very much looking forward to seeing the tables all dressed up. The Dark Side of Eden plates are beyond temptation! 83 queries in 1.103 seconds.